No alcohol may be brought into Levi’s® Stadium. Guests that are intoxicated or are perceived to be intoxicated will be denied entry into Levi’s® Stadium. Guests must be 21 years of age or older and in possession of valid government issued identification to purchase, handle, or consume alcoholic beverages at Levi’s® Stadium. There is a maximum of two (2) alcoholic beverages per purchase. All alcohol sales will be discontinued at the end of the third (3rd) quarter or earlier at Levi’s® Stadium Management’s discretion. Guests providing alcohol to minors will be ejected and subject to arrest. Guests possessing alcohol, who do not have proof of being at least 21 years of age, will be ejected and subject to arrest. Drunk and disorderly conduct or violation of any alcohol policy will result in ejection from Levi’s® Stadium without refund and the violator(s) may be subject to loss of season tickets and arrest. Alcohol purchased at Levi’s® Stadium is not to be removed from Levi’s® Stadium. Stadium Management reserves the right to change policies or procedures at any time without notice. Animals are not permitted in Levi’s® Stadium with the exception of service animals and service animals in training. Baby changing stations are located in all family restrooms throughout Levi’s® Stadium. These restrooms can be found on all concourses and on each Club and Suite level. 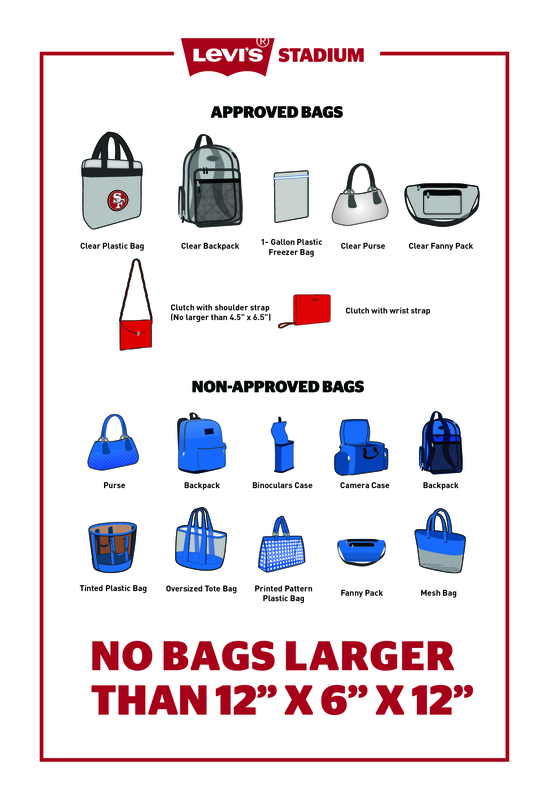 Guests with bags or items that do not satisfy the Levi’s® Stadium Bag Policy are encouraged to return their bags or items to their vehicle. If a guest does not have access to their vehicle then they are welcome to bring their prohibited bag to one of the Stadium’s complimentary, bag check-in stations where they may empty their bag and carry the contents in a clear zipper style gallon size freezer bag. The bag check-in station will hold guests’ empty prohibited bag for the duration of the event. These bag check-in stations are located in front of Intel Gate A and Toyota Gate F. The bag check-in stations close one hour after the conclusion of the event. If you do not claim a checked item at the conclusion of an event, please send us a claim through the Lost and Found section. Complimentary bicycle valet service is located in Red Lot 1 and Green Lot 1. Bicycle valet will be open 3.5 hours prior to the event through 1 hour upon completion of the Levi’s® Stadium event. Unattended bicycles that impede pedestrian are subject to removal and/or relocation. Levi’s® Stadium and/or its agents, shall not be responsible for fire, theft, damage or loss to bicycles or any other article left in or on the same. Levi’s® Stadium encourages all bicyclists to use the bike valet and/or the bicycle storage locations provided. Michael Mina’s restaurant, Bourbon Steak & Bourbon Pub, will be the exclusive home of Michael Mina’s Tailgate experience at 49ers home games. On non-gamedays, Bourbon Steak & Bourbon Pub will be open to the public for lunch and dinner. For more information visit michaelminastailgate.com or levisstadium.com/bourbon-steak-and-bourbon-pub. Cameras with 3-inch lenses or shorter are permitted. Camera bags are prohibited inside Levi’s® Stadium. Lights may not be used with video recording equipment. Tripods and monopods are prohibited (including selfie sticks). Guests may not reproduce or rebroadcast any films or photographs shot at the stadium without the expressed written consent of Levi’s® Stadium Management. Charter buses that are fully occupied with event attendees, and do not wish to tailgate, may park on Democracy Way between Patrick Henry Drive and Old Ironsides Drive. Buses that wish to tailgate must contact 408-673-2100 to purchase parking in advance. Children under two(2) years of age are allowed entry without a ticket if accompanied by an adult with a valid ticket and must share the adult’s seat. Diaper bags accompanying a child are permitted, but are subject to search and will be tagged. Levi’s® Stadium strongly advises that stickers, a name tag and additional information be pinned to the clothing of young children that may require assistance. Wristbands that can be given to children with the parents contact information, as well as seat location, are available at any of Levi’s® Stadiums Guest Service Stations located on the main and upper concourse. Strollers are welcome at Levi’s® Stadium, but are not allowed to be stored in an aisle or under a seat. Strollers may, however, be checked in at the following Guest Service Stations. Guest Service Station located on the outer perimeter of the main concourse above Toyota Gate F near sections 105/106. Guest Service Station located on the outer perimeter of the main concourse above Dignity Health Gate C near sections 129/130. Guest Service Station located on the outer perimeter of the upper concourse near sections 308/309. Closed Captioning is available for our guests at Levi’s® Stadium. Using your mobile phone web browser, please log on to https://www.eegicap.com/captioncast/. The Event ID is “levis”. Guests may also check out a closed captioning device by visiting any United Guest Services Station. There are eleven (11) premium club areas located throughout Levi’s® Stadium. Only ticketed guests with proper access are allowed into the clubs. These clubs remain open for approximately one hour following the end of the event. Premium club areas are located throughout Levi’s® Stadium. Club seat holders have access to the clubs indicated on their ticket and all general areas of the stadium. Access to one premium area does not necessarily provide access to other similar areas. Any distraction to the progress of the game or event. Other actions that cause a disruption and/or hinder the enjoyment of the event. Any behavior that impairs the safety and/or enjoyment of the event from other guests. Committing any of the above listed violations may result in ejection from the stadium, prohibition from attending future events, and/or arrest. Contact stadium ushers, security personnel or law enforcement officer. Text “SUPPORT” to 69050 with description of issue and location. We thank you in advance for your cooperation and assistance in maintaining a safe and enjoyable atmosphere at Levi’s® Stadium. Levi’s® Stadium is dedicated to providing a high quality entertainment experience. Guests who interfere with play, use foul language, make obscene gestures, smoke, or appear to be impaired may be ejected. Levi’s® Stadium has adopted an escalating scale of enforcement for Guest Code of Conduct violations. The purpose of this policy is to help ensure that all Levi’s® Stadium guests enjoy a positive event day experience. Levi’s® Stadium encourages guests to provide feedback on their stadium experience to any Levi’s® Stadium Playmaker by visiting one of the Guest Services Stations presented by United Airlines located in various locations throughout the stadium concourse, by e-mail at guestservices@LevisStadium.com. Levi’s® Stadium participates in the Bud Light Good Sport Designated Driver Program and encourages all guests to do the same. The Bud Light Good Sport Designated Driver Program provides one complimentary soft drink coupon to those who pledge to be designated drivers on event day. Guests can register for this program by visiting one of the Designated Driver kiosks at Faithful Mile presented by Global Syn-Turf or the United Guest Services Stations located throughout the stadium. New to 49ers game day, visit the Dignity Health Play Kind Zone at Gate C open 3 hours prior to kickoff. Fans 14 and under can partake in skills and drills at the 49ers Youth Football Mini Camp or take a trip down the new larger than life football slide. Young fans can also pick up their “My First 49ers Game” credential and sign up for the 49ers Kids Club. Enjoy complimentary face painting, airbrush tattoos and game day hair coloring. Levi’s® Stadium takes pride in providing elite service to all guests including those requiring mobility assistance. We provide a variety of services for our Guests with special needs. Included in these services are courtesy shuttle buses from several of our parking lots, golf cart shuttles in the Main Lot, and United Guest Services representatives to provide wheel chair service if requested. Levi’s® Stadium offers accessible seating as well as companion seating in many locations. Accessible seating can be coordinated through Levi’s® Stadium Visa Box Office at (408) 579–4449. Guests requesting wheelchair assistance can do so by calling our Mobility Assistance Team at (408) 579-4610. Take northbound US 101 and follow directions below. Take southbound US 101 and follow directions below. Take Great America Parkway northbound and turn left on Patrick Henry Drive. Turn right onto Old Ironsides Drive, and the drop-off area will be on your right, just north of Old Glory Lane. Take Great America Parkway northbound and park within Green Lot 1 for accessible parking. In addition to our Main Lot, several outside lots provide parking for guests needing mobility assistance. These lots, including Blue Lot #1 and Green Lot #4, Yellow Lot #2, provide courtesy shuttles to the Stadium. The same service from the stadium to the two designated lots is provided post event as well. All guests are encouraged to purchase pre-paid parking passes for the season. While pre-paid passes are for specific parking lots, guests who possess a DMV issued Disabled Person Parking Placard and a DMV issued Disabled Person I.D. Card may park in the Main Lot in accessible parking stalls after paying the $50 parking fee. Two outer parking lots will be serviced by Courtesy Shuttle Buses. These lots are Green Lot #4 and Blue Lot #1. These buses will begin running two (2) hours prior to kick-off and will end one and one half hours (1 ½) after an event has ended. These buses are for our guests who have mobility limitations and who may not have a Handicap Placard. Guests who possess a valid Handicap Placard are strongly encouraged to park in Green Lot 1 or Red Lot 1. There are over 300 Handicap Parking spaces in these two lots and Courtesy Cart assistance will be available in both. The courtesy cart service will be available in Red Lot #1, Green Lot #1, and the Golf course lots, which include Red Lots #6 and #7. There will be several Guest Service Stations in these lots that will be staffed by a Mobility Assistance Team Member to assist our guests. There will be seating for guests at these stations as they await a courtesy cart. There is limited space on these courtesy carts and we ask that Guests not needing extra assistance please respect the needs of others. Assisted Listening Devices will be available at all Guest Service Stations located throughout the Stadium. A valid California Driver’s License, or ID may be required as collateral. These listening devices amplify the stadiums public address announcements but do not provide service to the play-by-play broadcast. Wheelchairs are available on a temporary basis. Guests in need of a wheelchair for the entire duration of an event are encouraged to provide their own. Should guests need assistance post event, members of our mobility services team will be available to assist. For faster service, please contact a Guest Service Representative in your section. For more information on accessible seating, please call Visa Box Office (408) 579-4449. A limited number of accessible seats may be available for exchange on game day. Guests wishing to exchange their seats for accessible seating should enter Toyota Gate F at the north side of the stadium and proceed to the Visa Box Office for assistance. The San Francisco 49ers strive to provide support a wide range of charities and community organizations each year. We are pleased to support fundraising efforts by donating 49ers merchandise and memorabilia to be auctioned or raffled off at your nonprofit and charitable fundraising events. For more information and to complete the online donation request form click here. Please utilize the Pick-up/Drop-off areas at the intersection of Calle De Luna for guests using taxis. Guests using ridesharing options for transportation should utilize the pick-up/drop-off area at Red Lot 7. Take CA 237 eastbound and follow directions below. Take westbound CA 237 and follow directions below. Take North 1st Street southbound and right onto Tasman Drive. Continue eastbound on Tasman Drive to Calle Del Sol and turn right. Continue northbound on Calle Del Sol until you reach Calle De Luna. The drop off location is located along Calle De Luna. To access Levi’s® Stadium from Calle De Luna, walk towards Tasman Drive by heading southbound on Calle Del Sol. Turn right onto Tasman Drive heading westbound. Continue on Tasman Drive until you reach Centennial Blvd. Cross Centennial Blvd and turn left, heading into Toyota Gate F of Levi’s® Stadium. To access the pick-up location from Levi’s® Stadium, please follow the below directions. Guests arranging pick-up at the conclusion of Levi’s® Stadium should walk to Calle De Luna to meet their transportation. Fans should exit the stadium via Toyota Gate F and head eastbound on Tasman Drive. Fans should continue to walk on Tasman Drive until they reach Calle Del Sol, where they should head northbound to Calle Del Luna where they pre-arranged ride should be staged for pick up. Due to heavy event egress, it is recommended guests take public transportation or taxis to a pre-determined offsite location where guests can more easily meet those that are returning for passenger pick up post event. There are 38 escalators & 25 elevators located within Levi’s® Stadium. Located just inside the screening perimeter west of Levi’s® Stadium, this 60,000 sq. ft. interactive zone provides the perfect pregame destination for fans prior to each 49ers home game. Faithful Mile presented by Global Syn-Turf includes two expansive Bud Light bars, each with 20+ flat-screen HDTVs showing all the NFL action; the Pepsi Stage showcasing music and entertainment; unique engagement with many 49ers Partners; plus a food truck village and more! Faithful Mile presented by Global Syn-Turf is open 3 hours prior to each home game through kickoff. A valid ticket is required for entry. Private family restrooms are located throughout the stadium on all concourses, Club and Suite levels. Family restrooms are equipped with baby changing tables. For a list of all locations, please refer to the “Restroom” section. Access to the field is prohibited to guests of Levi’s® Stadium without proper credentials. There are three(3) First Aid locations at Levi’s® Stadium. For all events, food may be brought into Levi’s® Stadium as long as it is placed in clear plastic wrappings or bags that comply with the NFL bag policy. Fruit must be cut into smaller pieces. Only sealed plastic water bottles may be brought into Levi’s® Stadium. Thermos type containers or reusable water bottles may be brought into the stadium, but the contents are subject to inspection. Levi’s® Stadium opening times will vary on an event-by-event basis. Levi’s® Stadium guests are encouraged to report unruly guest behavior by contacting the nearest stadium personnel or by texting keyword “SUPPORT” and then a message that includes description of the issue and the location to 69050. The Edward J. DeBartolo Sr. Hall of Fame is a marquee exhibit in the 49ers Museum. Life size statues of each Hall of Fame member are positioned throughout. Two (2) interactive touch screen tables allow the visitor to access more information about each member. The Hall of Fame recognizes players, coaches and executives who have displayed one-or-more of the following qualifications: outstanding production and performance on the field, key contributions to the team’s success, and the embodiment of the spirit and essence of the San Francisco 49ers. Guests who have lost their items while visiting Levi’s® Stadium are encouraged to visit one of the United Guest Services Stations located within the stadium on the main and upper concourses during the event. Items that have been found are turned into these locations during events. All lost and found items for that event will be located at United Guest Service Station 105 for 45 minutes after each event. Guests can also inquire from home about lost items by filling out the lost and found form. Once a lost and found form is submitted, please allow 2-3 business days for a response. Guests will only receive a phone call if the missing item is found. For lost or missing person, please notify Levi’s® Stadium personnel or call Stadium Operations at 408-673-2100. For guests attending events at Levi’s® Stadium with children, we encourage you to visit a Guest Service Station to receive a wristband that can identify seat location, as well as a phone number. Monday to Saturday (In-Season): 9:30 a.m. – 7:00 p.m.
Monday to Saturday (Off-Season): 10:00 a.m. – 5:00 p.m.
Sunday (all year): 10:00 a.m. – 5:00 p.m.
Michael Mina’s Tailgate at 49ers home games is a one-of-a-kind, members-only club tailored for Levi’s® Stadium seat holders. Inspired by the essence of a backyard barbeque with friends on an NFL Sunday, Michael Mina’s Tailgate provides an innovative twist to the classic get together. Click here to learn more on how to become a member. The Levi’s® Stadium mobile app is available in both the App and Google Play Stores. The app is the easiest way to manage your tickets and parking passes. It also includes Game Center to watch instant replays and wayfinding. Season ticket members can also take advantage of their 15% discount in the app. The 49ers Museum is a first-class celebration of the 49ers past, present and future. Education and innovation are the driving forces behind the Museum, and it serves as an exciting, engaging home for fans of all ages. The Museum is open Fridays-Sundays from 10:00 AM – 5:00 PM, with specialized hours designated for the game day experience. For more information you can click here or contact us at museum@49ers.com. Young guests can receive a My First 49ers Game Certificate in the Dignity Health Plaza at Gate C through halftime on game day. No noise-making devices of any kind are permitted inside Levi’s® Stadium during NFL football games. Such devices may be allowed during non-NFL events at the discretion of Levi’s® Stadium Management. Please refer to “Permitted and Prohibited” for further information. 10 NRG Electric Vehicles Charging Stations (eVgo) are located in Green Lot 1. These spaces will be available for stadium guests driving electric vehicles on a first-come, first-serve basis each event day. eVgo Stations will be located adjacent to the entrance of Dignity Health Gate C.
The failure of any guests to obey the instructions, directions or requests of event personnel, stadium signage or management’s rules and regulations may cause ejection from the event parking lots at management’s discretion, and/or forfeiture and cancellation of the parking pass, without compensation. Parking lots associated with Levi’s® Stadium are scheduled to open 3.5 hours prior kickoff. Parking spaces are not pre-assigned unless otherwise posted. Levi’s® Stadium guests will be directed to their parking location by stadium personnel. A limited number of spaces may be sold day of event on a first-come, first-serve basis. Reserving spaces is NOT permitted. The parking pass allows for one space per vehicle only, and will be limited to vehicles measuring less than 17’ in length and 8’ in width. Vehicles measuring more than 17’ in length and/or 8’ in width are required to park in the designated oversized vehicle / RV parking area in Blue Lot 1 if space allows. Unauthorized vehicles or vehicles failing to park in the designated areas will be towed and stored at the owner’s expense. Tailgating is permitted in specified areas only. Non-compliance may result in ejection from the lot without compensation. Tailgating is defined as; the use of any item (including tables, chairs, free-standing canopies or umbrellas, awnings attached to recreational vehicles, coolers, barbecues, grills, games, generators, televisions, sound systems, food or drink, food or drink preparation or serving equipment, or other items as identified by the City Manager or designee) for the purpose of an outdoor gathering by one or more people prior to, during or after a scheduled stadium event. Each parking space must be used for vehicle parking only. Spaces may not be used for tailgating. Stadium Manager or its agents shall not be responsible for fire, theft, damage or loss to vehicles or any other article left in stadium affiliated parking lots. Levi’s® Stadium encourages carpooling and the use of public transportation. Non-tailgating buses are recommended to purchase parking in advance. Please see the charter bus parking section for more information. Take Lawrence Expressway northbound and turn right on Tasman Drive. Turn right on Old Ironsides Drive. The entrance to the parking area will be on your right, at Democracy Way. Take Lawrence Expressway southbound and turn left on Tasman Drive. Tailgating and/or loitering in non-tailgating bus spaces is prohibited. Buses/Limousine/RV tailgate parking is available on a pre-sold basis. There may be a limited number of spaces made available on game day on a first-come, first-served basis. All oversized tailgating vehicle parking passes are $160. Continue to Patrick Henry Drive. Turn right. The entrance to the lot will be on your left, south of Democracy Way. *Please note, parking prices listed above reflect pre-paid parking passes purchased in advance on Ticketmaster.com and through the Levi’s® Stadium app. Parking prices on the day of an event increase by $10. Levi’s® Stadium has over 110,000 square feet of luxurious and unique event space with upscale catering, multiple entertainment options, and a world-class hospitality. For more information please contact: specialevents@levisstadium.com or call 415-GO-49ers. Guests are encouraged to take Public Transportation. For additional information regarding public transportation, visit www.levisstadium.com or any of the following websites listed below. VTA provides buses and light rail transportation in the greater San Jose area reaching Mountain View, Cupertino, and Sunnyvale. VTA light rail trains will drop off and pick up at the Great America Station located north of the stadium. For more information please visit www.vta.org, or call 408-321-2300. ACE Trains provides services to Levi’s® Stadium from Stockton, Lathrop / Manteca, Tracy, Vasco, Livermore, Pleasanton and Fremont. For more information please visit www.acerail.com or call 209-944-6220. Capitol Trains provides services to Levi’s® Stadium from Auburn, Rocklin, Roseville, Sacramento, Davis, Suisun / Fairfield, Martinez, Richmond, Berkeley, Emeryville, Oakland, Hayward, and Fremont / Centerville. For more information please visit www.capitolcorridor.org, or call 877-974-3322. Caltrain provides services from San Francisco to South San Jose with stops all along the peninsula. On event day, Caltrain transports passengers from all locations to connect with VTA light rail trains or buses at the Mountain View Transit Center, located at Evelyn Ave, and Castro Street. For more information please visit www.caltrain.com, or call 1 (800) 660-4287. Re-entry is not permitted at any Levi’s® Stadium event. In case of emergency, guests can contact the ticket scanner and/or security supervisor at the nearest gate. There are public restrooms for men, women and families conveniently located on all levels of the stadium. All restrooms are accessible to guests with disabilities. The unlawful resale of any event ticket on Levi’s® Stadium grounds, and/or event parking lots is strictly PROHIBITED and may result in the loss of ticket privileges and/or prosecution to the fullest extent of the law. For NFL Football Games signs and banners of any size or type are NOT permitted. For select non-NFL special events, handheld signs may be allowed as long as they do not impair the view of other guests and do not contain vulgar, offensive or graphic content. No sign may be of commercial nature. Banners are prohibited. Dry erase boards and signs attached to sticks or poles are prohibited. This policy is subject to change based on Levi’s® Stadium management’s discretion and without notice. In accordance with the Santa Clara City Ordinance, Levi’s® Stadium is a SMOKE FREE facility, which includes, but not limited to, cigarettes, vapor cigarettes, electronic cigarettes, and joints. Designated smoking areas have been established at select location(s) within the stadium perimeter. Smoking marijuana is prohibited on stadium grounds. Guest Service Station located on the outer perimeter of the upper concourse near sections 309. The designated taxi drop off and pick-up area is located on Calle De Luna. This area can be accessed by walking eastbound on Tasman Drive and turning left at Calle Del Sol. The designated ridesharing drop-off and pick-up area is located at Red Lot 7. All persons, two years of age or older must have a ticket for admittance. All Guests are encouraged to be in possession of their own ticket at all times. Ticket holders can manage game tickets using the official Levi’s® Stadium or 49ers Mobile App. For information on the new mobile ticketing policy please visit www.49ers.com/tickets/mobile. Guests should have their tickets ready to scan upon approaching the stadium entry gates. The ticket barcode must be visible. Guests should be prepared to present their ticket upon entering the seating area. Guests with ticket related problems should visit the remote box office booths located at the entry gates located in front of Intel Gate A, Dignity Health Gate C, or the Visa Box Office located at the north end of the stadium inside Toyota Gate F.
Lost or stolen tickets may only be replaced through the season ticket member of record. Tickets obtained from sources other than the San Francisco 49ers or its authorized agencies may be lost or stolen and in such cases will NOT be honored. Unique Towing provides complementary services to stranded motorists in Levi’s® Stadium lots. These services are available to all guests and include recharging drained batteries, changing flat tires, and lockouts. Additional services will be available per guest request at their expense. The services will be available on site beginning 3 hours prior through 1 hour after completion of Levi’s® Stadium event. If services are needed, please contact 408-579-4600. In compliance with the NFL’s Best Practices for Stadium Security, as well as the Santa Clara stadium ordinances, weapons of any kind are strictly prohibited inside Levi’s® Stadium. Nobody, including off-duty peace officers, are authorized to possess any weapons unless expressly authorized by the Santa Clara Chief of Police. Any violators of this ordinance are subject to arrest. Limited game day will call services are available at Levi’s® Stadium. Patrons with will call needs on game day should visit the remote box office booths located at entry gates located in front of Intel Gate A, Dignity Health Gate C or the Visa Box Office located at the north end of the stadium inside Toyota Gate F.
Game Day Will Call opens three (3) hours prior to kickoff. Will call requests received prior to game day will be forwarded in advance of the game to the intended recipient via the Levi’s® Stadium Mobile App or by email.